THEM Anime Reviews 4.0 - Yu-Gi-Oh! Notes: Based on the manga from Takahashi Kazuki, available from Shonen Jump USA. This is not a sequel/second season to the 1998 series animated by Toei and is regarded as a separate work. Young Motou Yugi was a quiet boy who liked hanging around with his friends, but there's was something special about him as well. You see, using the power of his Millenium Puzzle, young, shy Yugi transforms into Yami Yugi, who likes to challenge people to card games. Yugi, together with his best friend Joey, plans to beat any challengers who await them. First it was Pokemon. Then it was Digimon, then Monster Rancher, then Flint the Time Detective, then CardCaptors, then Mon Colle Knights, then Medabots. You get the picture? Multiple anime trying to cash in on one earlier anime of the same genre. And for a while Pokemon (and its clone anime) did well in America..until people just plumb stopped caring about them. No one went to see the movies. No one was watching the television show like they used to. Pokemon was *gasp* dying. So 4Kids, the people who first dubbed Pokemon way back in 1998, needed a new anime to hook kids into. So they took the most popular thing in Japan after the big "Pokemon Market Crash of 2001" (as I call it) and went to Yu-Gi-Oh. Although it did nowhere as well on television as Pokemon did in Japan, it made up for it in the billions it made off of the card game and video games, with one coming out every three months (I'm not joking). It also had a long-running manga that had been going on weekly since 1996, which by then was over 250 chapters long. So 4Kids put two and two together and decided that Yu-Gi-Oh would be their savior. And so they bought its rights, and started dubbing it right away. And it aired September 2001 in America for the first time. The result? A big old pile of crap. "But it's just a children's anime!" you might say. "You're being too harsh!" Look at the list of anime I explained above. Each show had something in it I liked (except Medabots). Yu-Gi-Oh!, meanwhile, has no merit whatsoever. Problem #1: The animation and art are very poor. Characters have stupid hair designs (especially Yugi himself), lame tastes in fashion, and move at a rate less that makes Homestar Runner cartoons look like Disney films. And for a show that's hyped to be about action, the show sure doesn't have a lot of it. It feels like 20% actual battling, 80% talk about the next move. Either that, or someone outside the dueling arena talking about the next move someone is going to make. The backgrounds are colorful and pretty (if not dull), but it's not enough to make up for everything else wrong with the animation. Problem #2: Everyone's a cardboard cutout stereotype. Yugi is a spineless twit, Tea is the kind, but loud-mouthed female with the pointy breasts (girl=fan service), Joey is arrogant and over-confident, and Tristen is the silent type (saying, at most, 5 lines of dialogue an episode). Then there's Seto Kaiba, who's Vegeta if he ever got into a card game ("Must ... become ... stronger"). As for plot...well, what plot? 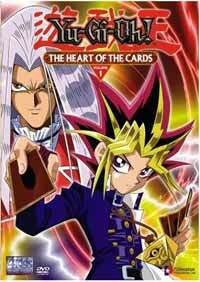 What little plot there is is just an excuse to get into more card duels, some that last as long as five episodes. Fun! Occasionally, non-card dueling scenes occur, but good luck finding them at a rate more than once every ten episodes. Problem #3: Then there's the dubbing. Everyone knows how well 4Kids dubs anime (snicker), and Yu-Gi-Oh! is no exception (snicker). That's why 4Kids thought it would be fun to throw in dialogue everywhere they can, eliminate the Japanese score and replace it, cut out whole scenes for no reason, eliminate all words on the cards (leaving me to wonder how they know the names of all these cards), and change everyone's names. But since only little kids are going to watch this (or stomach the crap in the English dub), 4Kids didn't care about the 900 changes they made to the show, which sure ticked off a lot of die-hard Yu-Gi-Oh fans who got into the craze from the original, Japanese source. Couple this with an opening "song" that makes the Digimon theme song sound like an Elvis song, and you got yourself a painful experience that will have you reaching for the power button on your television, and FAST. In case you're one of the few lucky people who have yet to see Yu-Gi-Oh!, don't bother to start. There's plenty of better anime out there, and they have all better animation, writing, characters, music, and even better gimmicks than this. Unless you really, really want to see your favorite Yu-Gi-Oh cards battling in a crappy, long-winded, poorly drawn and animated television show concocted by Konami to sell more cards and video games, please don't bother to watch Yu-Gi-Oh. Recommended Audience: The English version removes all traces of anything remotely offensive or Japanese for your safety. The Japanese version can get pretty gruesome, though.